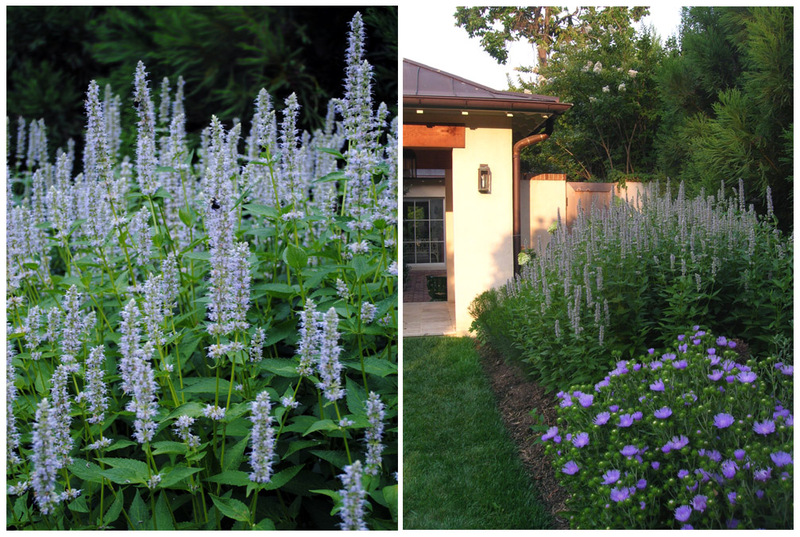 Back in April, I introduced our blue garden which we planted in July 2011. This garden features plants that flower predominately blue, lavender or purple. To add depth and texture to this tone-on-tone garden, I mixed in plants with interesting foliage as well. I designed this informal garden with scale and height in mind - one we can see and enjoy from inside our home. Also, I wanted to attract butterflies and birds. Most importantly, this garden needed to offer privacy from city neighbors. It has been a challenge to find plants that bloom a true or pure blue color. Do you have any plant suggestions? The following photos were taken at dawn or dusk (when light was softest) throughout May - July. The blue garden at it's peak in June. American Wisteria blooming in early May. There are now small boxwoods under the Wisteria. 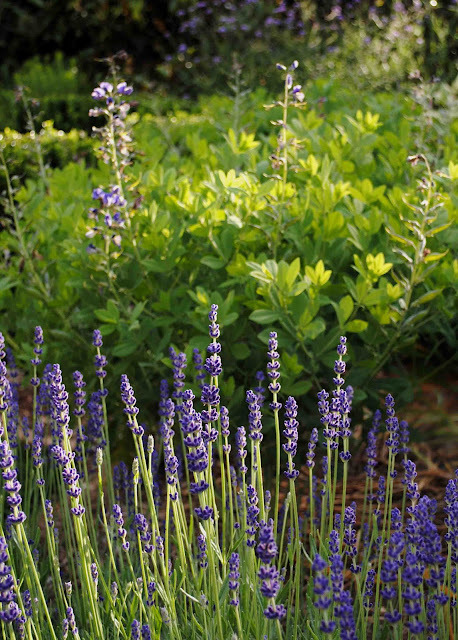 Spikes of indigo blue Baptisia flowers behind fresh green Hidcote Lavender, mid May. Baptisia flowers fade as Lavender blooms in early June. So far lots of bees, some butterflies, and even a few hummingbirds. A contrast of textures in June: Russian Sage, Blue Paradise Phlox, Hidcote Lavender, and Smokebush Grace's purple foliage and flowers. Interestingly, the Smokebush will turn into a big gray cloud in early August. Early June with perfectly formed Allium Globemaster. A dizzying display of Verbena Bonariensis. Buddleia Purple Emperor will bloom all summer. I took the photos during last light one June evening. Feathery foliage of Arkansas Amsonia with flowers of Geranium Johnson's Blue. 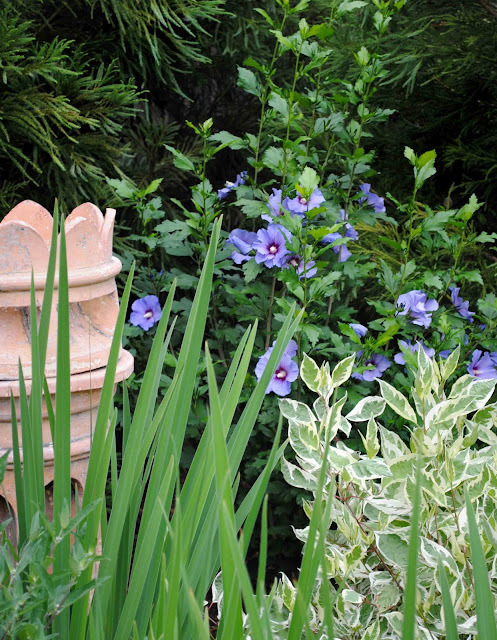 Blue Satin Rose of Sharon next to chimney pot, early July. The courtyard garden is behind this pavilion. We planted mature Cryptomeria evergreen trees, and they are already over 20 feet tall (3 shown top right). Close up of Stokesia, which will bloom from July - Aug. Early July: Agastache Blue Fortune is another abundant long bloomer. Hope you've enjoyed this tour. Thanks for visiting! Oh Loi, this is one of my favorite kinds of posts! Gorgeous garden, photos-- up close and from a distance, and all the detail-- what's planted where, what you were thinking when you planned it. Yum!! It really looks beautiful. I'm bookmarking this one to return to again. I might have to borrow a few ideas for my garden. My only blue flowering plant this year was Salvia 'Victoria Blue'. It overwintered from last year because of the mild winter. But it got a nasty case of powdery mildew, and I haven't been able to enjoy them much. What about Oxford blue lobelia Loi? It grows anywhere. Delphiniums are the truest blue too, and ceanothus, though it can be tricky. Oooo, fabulous post Loi, your blue garden is very dreamy. This is the second time a variety of Amsonia has pricked my interest recently, love that feather foilage, very tactile. The plant that springs to mind is Salvia Patens which is famed for it's true blue. Your garden is looking so beautiful. Love all the blue with the green. Be still my heart....Loi this is stunning. Your lavender is gorgeous and those Allium are amazing. Happy weekend my dear inspiring friend. I wouldn't have thought it was possible, but the garden is even more beautiful than when I saw it in the beginning of June. I don't have any suggestions for you; I think all of it is perfect just the way it is. Enjoy it this weekend! Absolutely beautiful photos of your amazing garden!! You know I am a big fan of catmint (nepeta). Are your winters too cold for plumbago? I am crazy about it's blue! Well that's my garden plant list sorted for next year Loi - off to the garden centre now! Loi, you give me the most incredible hope and inspiration! I could look at this all day, it looks like it's always been, but I know you have worked long and hard to get to this point. It is just spectacular and I applaud you! I hope you don't mind if I copy some of what you have done in my own space??? Have a great weekend dear heart. Really beautiful, Loi! Very impressive after only one year. 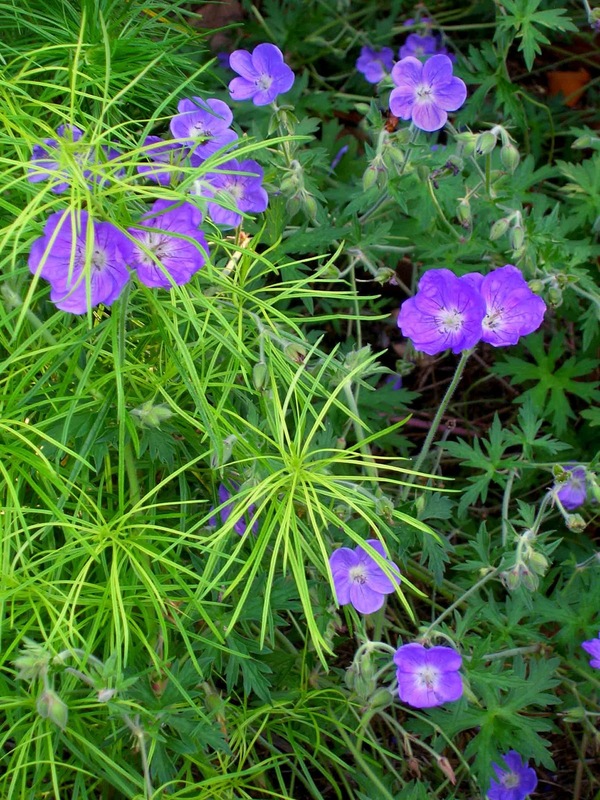 The perennial geranium is kind an unassuming little plant but I'm really growing to love it in my garden. While other plants put on shows that seem to come and go too quickly, the little geranium just seems to be there from early summer right in to fall. I love, love, love your blue garden! I was going to recommend the butterfly bush but I see you have one. You should try adding some "Blue Queen Salvia" it blooms a true blue. I have a blue/purple garden under my kitchen window but I'm thinking it needs a touch of white or yelllow mixed in too. Happy gardening! Your garden is stunning Loi, a fitting reflection of your elegant interior. surrounded by peace and quiet and twinkles of blue everywhere. Truly inspiring. Loi... The garden is lovely! I hope that you didn't have much damage and that you weathered the storm without too much trouble! Loi, so beautiful and a relaxing area with the soft palette of color. 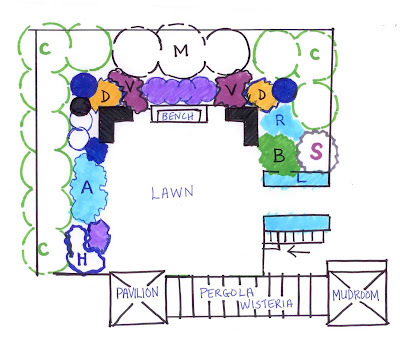 I might add extra hydrangeas in various shades and varieties of blues/ lavenders/ periwinkle. What a beautiful garden Loi! These colors are my favorites and make for a very serene atmosphere I think! Here in the heat of Central Texas I can only dream of such a lush green garden; thanks for sharing! 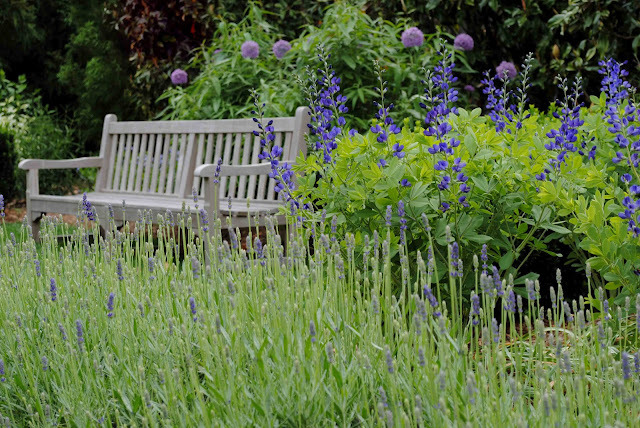 For more blue I would try Delphinium or 'black' Salvia, it is a very deep blue. The garden is beautiful. I love it. Thank you for sharing. Who doesn't like Sweet Kate Spiderwort and Blue Plumbago in the garden. Loi, your garden is absolutely beautiful! You've obviously done a lot of research, planning your outdoor room with the same care as all the indoor rooms! 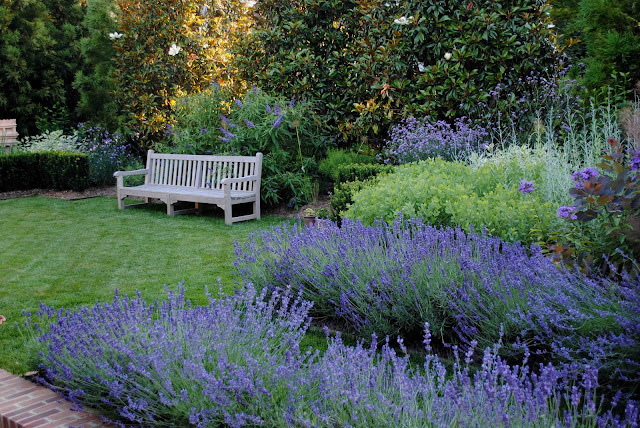 I imagine that sitting in your garden creates a great sense of serenity. Loi, this is absolutely beautiful! Blue is my favorite color so I think I might have to copy you on this idea. I have never thought of it before seeing it here! Very clever! Don't know what I'm most impressed by - you're beautiful garden, stunning photography, or knowledge of plant names. I am in love...what a beautiful garden! I love all of your beautiful photos, and so many interesting flowers. I hope you are staying cool! Are you one of the lucky few with power! So glad to have found your blog. What an amazing garden!!!! Just beautiful. Filled with all of my favorites. We also have large cryptomeria trees as a privacy wall between us and our neighbors. I've planted Russian sage and Stokesia as well. Keep trying lavender...but it's just not happy in Little Rock. You are an amazing photographer as well. Your garden is stunning. I love the tone on tone plantings. I'm cooling off just looking at these beautiful photographs. Some day I would like to see your garden in person. You have created a beautiful outdoor room! These photographs are beautiful - the lighting is lovely, but there is also a crispness and clarity to the photos that makes them look professional. Blue is my favorite and your garden is so lovely. I planted the perennial plumbago last year and it's done extremely well in my front yard where the sun is very strong. Low to the ground w/a blue flower, it could be a nice filler plant. 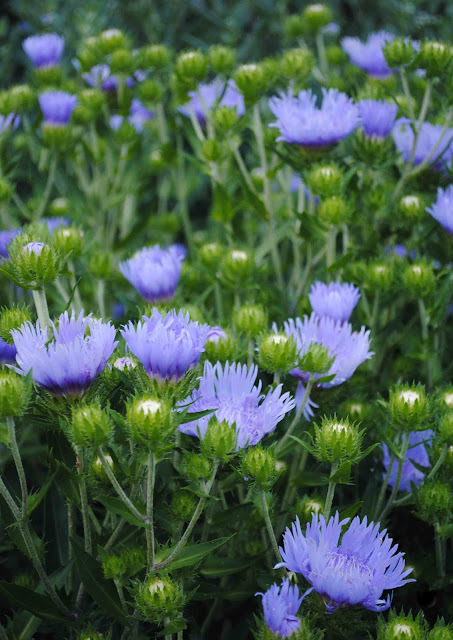 I've added stokesia to my list after seeing yours as my backyard needs some more blue in the summer. Well, you have done it again, Loi. Your garden is perfection. It amazes me it looks so mature in just one year's time. I love all the plant choices, as well. The only blue I would recommend that is in my garden is agapanthus. 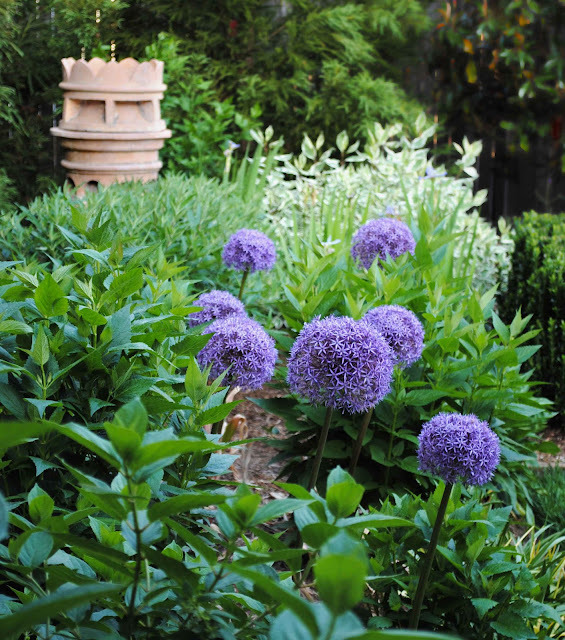 It has the same drama as allium, although usually somewhat taller. In D.C., it may have to be planted in pots and wintered in a shed. Not that you need anything else in this garden. Did I tell you it was perfection? So beautiful Loi! Love all of your shades of blue. The pergola is inspired. You must enjoy many wonderful meals at that table...in your gorgeous garden. Tuscan Blue Rosemary perhaps? What a beautiful, beautiful garden Loi! All the blue must be a lovely escape (visually;) from the heat. 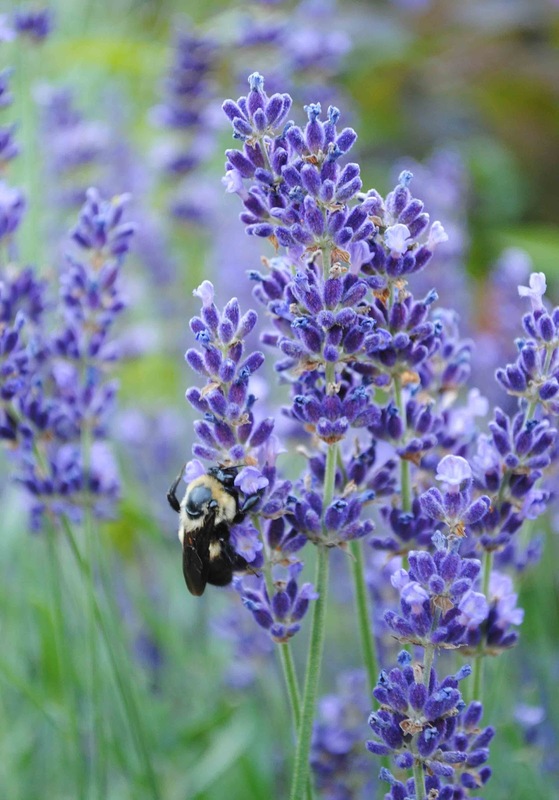 My favorite blues are my English lavender and Blue Fortune Hyssop- which is a real stunner in the heat of the summer. I so enjoy your photos of your home and exquisite gardens. It looks like it is fairing well in the heat, non? EXQUISITE is a word that comes to mind! My love for blue and white chinoiserie/china was extended into my garden. I would agree with the suggestion of Agapanthus, which look stunning in pots, and Ceonothus comes in some fabulous shades of blue (and various sizes). I am researching Borage which is growing wild in the hedgrows near me, the foliage is very tactile and the flowers are a true blue but not sure if it will grow in the garden yet? I love to use slate, lead and galvanised steel with this colour scheme - more of the tone on tone theory :-) Keep the posts coming, we are all falling in love with your panache! What a stunning garden full of blues. I love your sketch! Thanks for sharing your green thumb! Oh my gosh, Loi, your garden is stunning!!! Don't think there's anything that would make it more perfect or beautiful than it already is. Wow...what a stunning garden. Love it all and the alliums especially. For another blue, check out ageratum. It blooms during the summer and is very heat tolerant. Loi, it is glorious!!!! I'm blown away. paradise. 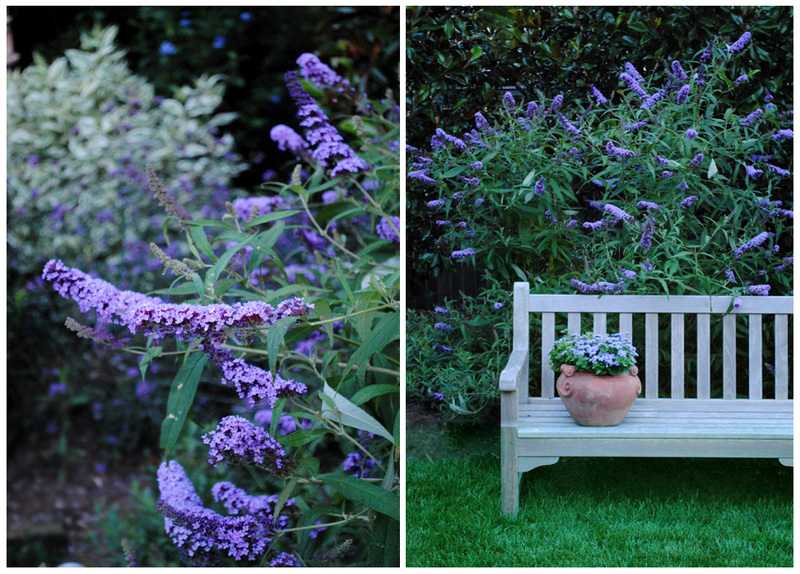 Love your bench by the butterfly bush, gorgeous tree walls! The smoke bush behind the flowers! Everything! Just love how you put things together. Love it all!! And how wonderful you're able to take these beautiful photos, to remember always. Great job, Loi, because I think finding blue plants is difficult but so beautiful in gardens. I was going to recommend baptisa, but someone recommended that already. I have to stake mine because it has a tendency to flop, but once staked, it behaves very well. Also, if no one has recommended it, aconite or monkshood is an absolutely beautifully blue plant. For upstate New York, it blooms in the autumn. Sometimes, I forget about it, then when I see it in the border of the vegetable garden, it takes my breath away - a really great plant that was a gift from a friend who moved to Florida where it will not grow. Hope it will grow where you are. Inspiring post, but I would expect nothing less. I like how you think! and sketch. It's calm and orderly and your garden reflects that. Just divine. I know you must enjoy it very much. Thank you for sharing the beauty! I am completely jealous of your green thumb. 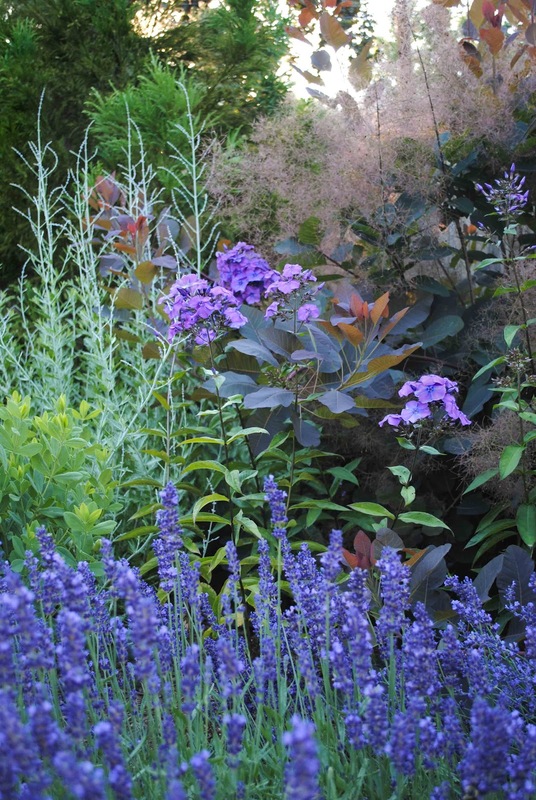 I love that you chose one color for the plantings and the effect is so much more substantial than a mixed palette. Elegant design and beautiful planting. Thanks for the plan. It really helps to see how the garden works as a whole. I wish I could grow a Cryptomeria hedge! Love the generous bench. You have a great sense of scale and proportion. Well I can see that by the time you get to my comment every descriptive word has been used and used again. So I can only echo what everyone knows to be true........beautiful, stunning and expertly executed. Here is where hard work, lots of planning and research really pays off. This beautiful showpiece of a garden didn't just drop down from the sky.....it was molded and shaped and lovingly coaxed to life by a skilled master. You are a true artist my friend. And a generous one as well, who happily shares his knowledge with others. And we are all the better for it. Loi, first of all this is exquisite! I have to say that while driving home from New Orleans yesterday my face was buried in my iPhone trying to see these phenomenal pictures as best I could! I'm so glad I'm finally seeing them up close and personal on my laptop! Your garden is the prettiest I've ever seen and I wish so badly that you lived nearby! I would hire you in a heart beat to design ours! Or at least draw me up a plan! I agree with everything that Phyllis and Mona said, too. I would love to know what kind of camera you are using. It certainly helps that your yard and home are so pretty but truly the pictures are amazing and crisp! Thanks for sharing this lovely garden with us! Everything in your garden is a welome sight. Thank you for generous comments and compliments @ Ideezine. I wish you cooler temperatures and dragonflies galore to compliment an already beautiful garden. I love garden design, history of gardens, especially maintaining a garde as it matures. Your garden is outlined perfectly and shows many that a garden plan that is simple has magnificant results. I also believe that garden/landscape design is as much about the view inside a home as it is outside. Privacy, texture, aroma, height, volume, walking, sitting, relaxing, and garden art are all part of what goes into the recipe for a perfect paradise on earth. Loi you covered all the bases...beautifully! I wish you many hours of enjoyment in this lovely outdoor space. You've earned it and with this heat may I suggest a misting system...lol! I am always assured that I will get a dose of true beauty when I visit here. Your garden is stunning...love all of the blues and thank you for the great photos and your details in the planning of the garden...great info!! Loi, I love your artistic style. Not only are you a wonderful interior designer, but a fabulous landscape artist. The garden is beautiful with all the blues. Blue gardens are so restful and cool looking during this hot spell . Hello, everyone - Thanks so much for all your suggestions and, very kind comments! I truly appreciate it. I love delphiniums but they unfortunately do not grow well in the DC area...too hot and humid. Many of you suggested salvia and plumbago, both I will definitely try. Thanks, again. Loi, Loi, Loi! You are too talented! I could spend hours in this garden even in the heat!! I am saving your sketch and using it next spring! I know that the scents linger around you. So wonderful, friend. What a divine garden you've created!!! I love the tone of blue on blue. It looks so serene, peaceful and exquisite. 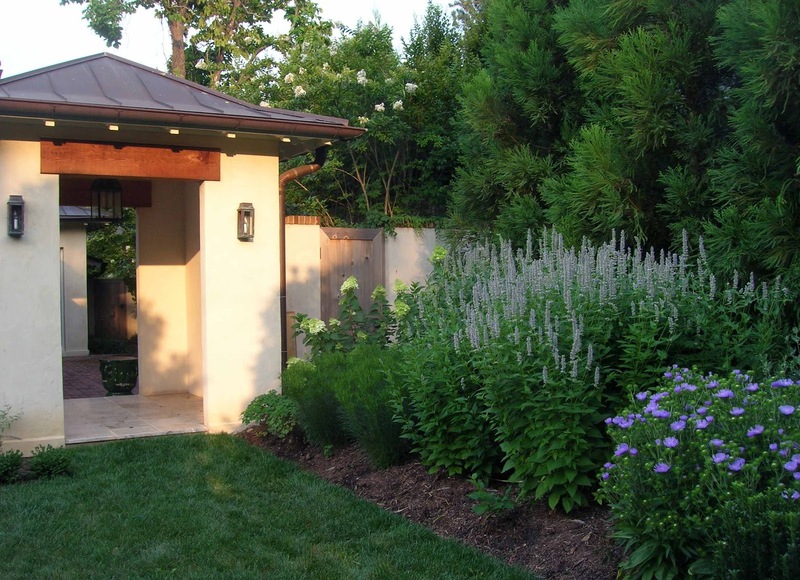 As one who heartedly believes in the power of landscaping....I'm in heaven with this post! Hope your week is off to a wonderful start, Loi! Hi Loi - Your blue garden is so lovely! What a great idea to focus on one color for an area of the garden. Your posts are so informative too. Thanks for sharing the photos and your knowledge with us! 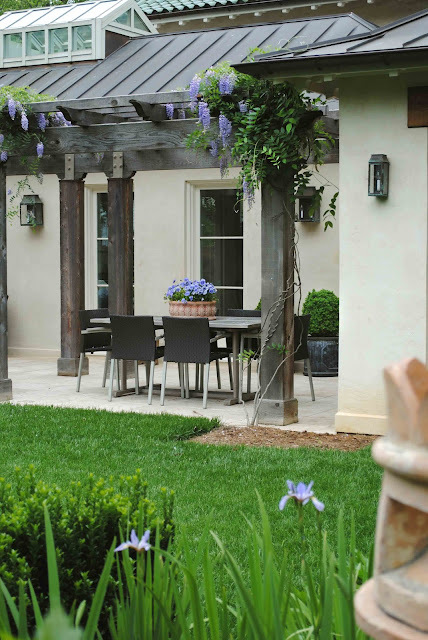 OMG SOO beautiful outdoor spaces:) I thank you for sweet words on my blog. have an awesome week and come back and visit soon. Thank you for the beautiful blog, I have really been enjoying it! Your garden is wonderful--and after one year?! I have a purple and white garden with many of the flowers you mentioned. In addition I love Catmint (Nepeta) in the Walker's Low variety, and Siberian Iris--their bloom time is short but their slender, grassy foliage is beautiful on its own. Thanks for sharing! Gorgeous! LOVE all the blue/cool purples...have you ever seen a perennial called Sea Holly? I saw some in a garden in Bend last year and planted some as soon as I could find it-it looks a little thistle-like, but it's a beautiful pale purple in bloom-good height for the back of a garden as well. So beautiful and inspiring! I don't know if Delphinium would work in your climate, but you might try the variety "Butterfly Blue." Balloon flower works as a purple-blue entry in my garden. Also there are several varieties of clematis that might work for you. Sorry, I meant to say you might try Butterfly Blue delphinium as an annual. Their color is so lovely! 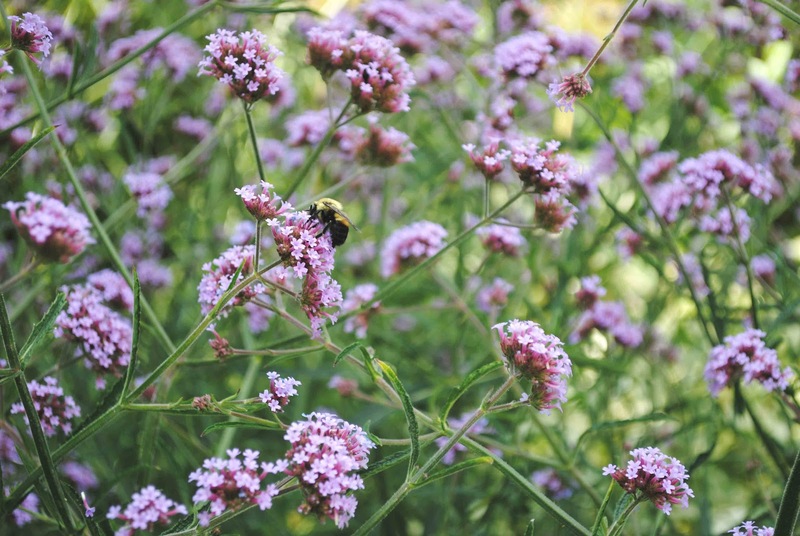 Just found your blog and I'm really fascinated by your beautiful garden! Blue is absolutely one of my favourite color, but I couldn't imagin all those species of blue flowers together could create a space so divine. Right now I am planning my new garden, surely your will be a great inspiration for me! Just found you via Meg at Pigtown Design. She's right, your world is wonderful. Now following from the UK. Great to meet you. Hi Loi, sorry I'm late to your post! just catching up now! Your blue garden is absolutely breathtaking! you are an amazing gardener aswell - you are one talented man! Your wisteria over the patio area is stunning when that matures it is going to be spectacular. Your photos are also truly amazing, love the bee one and I wish we got hummingbirds over here, I've only seen one in my life in France, it was gorgeous. When you asked for plant ideas in true blue the first thing that popped into my head was Geranium Johnsons Blue but then I saw that you have it! I think you have most of the true blues already, what about the Himalayan blue poppy? you may have it already, if I think of any more I'll let you know. Your garden is SO healthy, is your soil naturally good or did you add tonnes of manure it looks SO lush!! You really have green fingers! Your blue garden is amazing! As is everything your creative hand touches. What a lovely place! I found your blog through Meg at Pigtown Design, though I've been a fan of your store for a long time now and need to stop by the next time I'm up that way! Your garden is gorgeous and I'm sure another commenter has already mentioned these but Lobelia and Delphinium both offer true blues and would be a beautiful compliment to the flowers you already have. Pure bliss, Loi! You have quite the perfect blue garden. All the lavender reminds me of the beautiful lavender fields in France. I've seen quite a few humming birds here in Peru, and I was quite surprised because they are mostly brown. The ones we have at home in Argentina are green. I'm sure they will start appearing in your garden soon enough. Thanks for the amazing tour, Loi! Wow! Your garden is gorgeous! It has a lot of depth and different textures, they are just stunning! Thanks for sharing your amazing garden with us! By the way, I am hosting a fabulous giveaway! Come by and enter for a chance to win $100 credit towards a beautiful personalized canvas! This is a giveaway you don't want to miss! So sorry that I am late to comment. You are such a generous blogger Loi, thank you for including your planting plan I know just what to buy now! Our garden is so dreadfully GREEN, it would benefit from an injection of the glorious blues shown in your post. I hope the hot weather over there hasn't scorched too many of your plants. What a glorious space and great photos. Makes me want to be there! The plant list is welcome too! I can only imagine the scent in the evening. Been out of town for several days in Chicago, returning to my favorite blogs and of course you do not disappoint with this gorgeous post of your fantastic garden. And you established it in one year! Going back to read again one more time and will show Arvind this evening. We struggle with so many perennials because of competition from all of our shade trees roots and canopy. You seem to have the perfect conditions! Do you like agapanthus? They are lovely in pots! What an amazing garden! 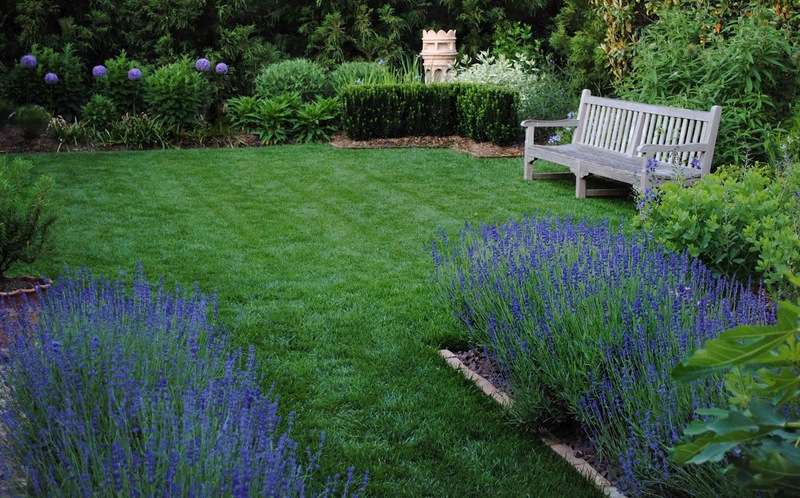 The blue garden is so pretty and I love all the lavender. I'll have to bookmark this for ideas at some point. We are struggling with our wisteria. It rains so much here we frequently have a difficult time getting areas to drain properly. I can't wait to read some of the comments - wow! Lots of great ideas here! Loi, Your gardens are absolutely stunning, gorgeous, and welcoming! I can't grow a weed, but I love to look at outside beauty. I caught a glimpse of the planters you used at 5500. I had ones from Restoration that we HAD to leave in our Norfolk condo! I miss them, used them on our desk with seasonal color..they were grand. What a lovely website which I came across by chance - your blue garden is enchanting - just wondering if you have ever tried Delphiniums - so many glorious shades of blue to choose from, as long as you don't have slugs, which will munch the lot! Also, some of the lovely dark blue-grey hostas could look fantastic. Shrub Ceonothus is also shades of blue, can be rather lovely. You probably have these suggestions already - just a thought. I'm in the UK, perhaps these plants are not available with you? Anyway, thanks so much, gorgeous. Stunning! So beautiful...your whole blog is just wonderful. Thank you for visiting rheingruen. Your garden is so beautiful! I like the blue color very much and also your furniture in this beautiful garden environment. And also your way to work with textures. We have more or less the same perennials . - Agastache blue fortune, lavender, Perovskia, also many herbs as Sage, Thyme, Nepetia Walkers Low and Danube Blue... and we have almost the same old chimney from London as a Point of View. We found it at an antique store in Germany. Greetings Iris - Hope you can understand "my" Englisch language. Your blue garden is stunning, as I knew it would be! I've enjoyed having simple Cornflowers in my garden. They self propogate sometimes, which I like. They're very hardy, and the flowers are a lovely blue! I have to say, I love it that your garden speaks to what lies in the interior of your home. I believe that's another form of "integrity." have you tried catmint yet? it's so pretty and short, and wonderful leaves, and best of all it reseeds, and blooms again in the fall! love the blues! debbie in indiana! Very pretty garden. Great ideas of placing flowers. This gives me some ideas how can I upgrade my garden. Thank you for sharing.